I believe this was the first article on me that featured my life as both the pioneer of Baby Sign Language in the country and as the The Bull Runner. Those two worlds never seemed to merge, save for a couple of people who knew me as both. But, now I’m realizing that I can’t keep them so separate anymore. At first, I thought they depicted me as more active and busy than I really am. But, upon reading it again, I realized it was pretty accurate covering my hectic but happy life as mom, entrepreneur, and overly obsessed runner slowly making my way into triathlon. They misspelled my last name and gave out the wrong blog address, but after calling me “Speed Mom” those are non-issues to me! 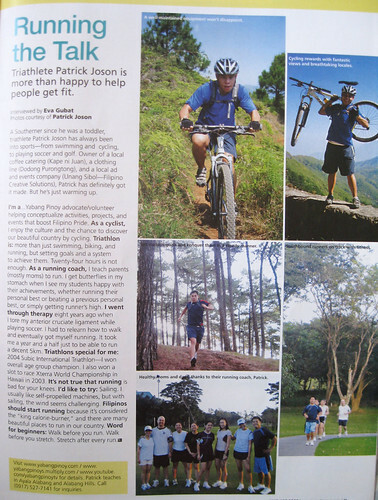 The magazine also featured a friend, Patrick Joson, a running coach who trains in Alabang. I first met him at the Takbong May Yabang race in Cuenca Park last year. Since then, he has been inviting me to run with them at the Ayala Alabang golf course and, with the improving foot, I hope to do so soon. Note: Yes, I know this is old news as it was the last two month’s issue. But, it took me quite a while to post this as my scanner died last month. Hence, the slightly hazy images above using my digicam. * Thanks to Ben Chan of Photovendo and Dindo Caguiat (RunningDATcom) for the photos. congratulations!!!!! More success to u Jaymie (thebullrunner)!!!!!!!!! Hi Jaymie! Just read copy of Southern Living. Talagang Celebrity ka na! Hope to see you again in the next races…. Hi Mhel! Nice seeing you too! How was your 21k? Mary Anne! Animo tri! Tara! It should be celebrity speed mom!!! Congrats!! Next job, sports talk show host!! Saw you at the Botak race last Sunday, wasn’t able to say high — was struggling after the race to stay alive!!! he! he! Congrats again. Thats so cool Jaymie ,seeing hubby and the kids running with you. Keep it up and more power to your family. hi tbr! I had been preoccupied in between things so lately i’ve been trying to catch up with your posts. Nice to see you’re featured in the mag. What’s next? Cover spread? Woot woot! Btw, when is the next issue of your mag available? Congrats on the mag feature and the new cool title! naks, jaymie you are now also called SPEED MOM! Hi Odie, although i’m not THAT fast! Hi Sam! Next issue will be July. I’ll write a post on it soon. did i read it right? eva gubat is the writer? 🙂 she’s a friend.